G Joel Bitonio vs. DI Geno Atkins — Bitonio continued his excellent season with another good performance against a very good Jaguars defensive front last week. He was the only Browns offensive lineman who didn’t allow a quarterback pressure in pass protection, and his 82.3 overall grade was the fifth-best given to a guard for the week. Life doesn’t figure to get any easier for Bitonio this week, as he’ll be tasked with keeping Geno Atkins in check. Atkins owns the third-highest overall grade for an interior defender this season (91.5) and enters this matchup with four consecutive five-plus pressure performances, something he’s done in all but three games this season. WR Corey Coleman vs. Bengals cornerbacks — Cleveland wasted no time getting Coleman involved in his first game back after being activated from injured reserve, targeting him nine times while no other wide receiver saw more than three passes come their direction. Considering the competition, it was a solid outing for Coleman, who hauled in six of those passes for 80 yards (though he did have one drop). Coleman’s 2.14 yards per route run ranked 24th of 68 qualifying wide receivers on the week. 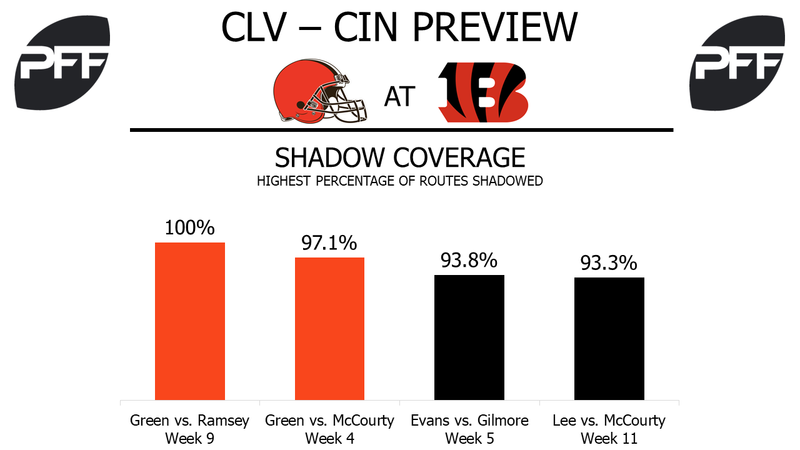 Cincinnati hasn’t shadowed any receivers this season, so the Browns should be able to dictate matchups for Coleman in this one. Nearly-botched-100-yard-interception-returns-for-not-touchdowns notwithstanding, they’ll likely opt to target Dre Kirkpatrick over William Jackson — Jackson has yielded a 44.2 passer rating on throws into his coverage (fourth among 118 qualifying cornerbacks) while that number jumps to 91.9 when Kirkpatrick is the primary cover man (63rd). QB DeShone Kizer when not blitzed — After posting a career-high overall grade against the Lions, Kizer predictably struggled against the Jaguars pass defense, earning the third-worst overall grade given to a quarterback on the week (39.7). 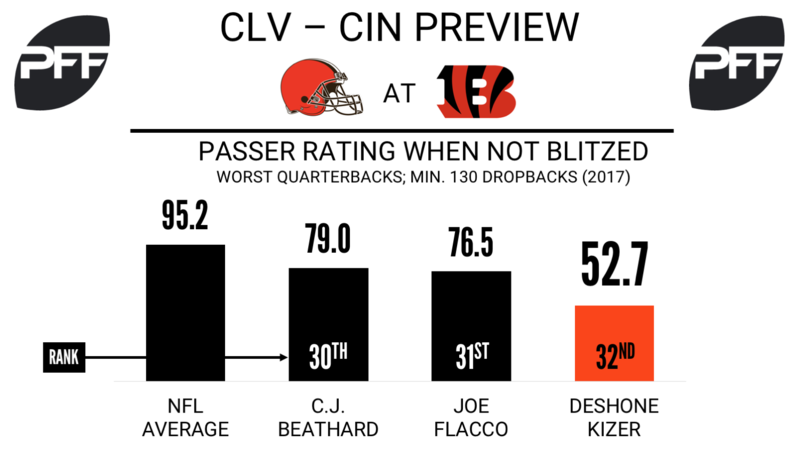 The rookie quarterback’s challenge this week will be to find openings against a Bengals defense that prefers to play heavy coverage — Cincinnati has blitzed on just 17.5 percent of opposing dropbacks this season, the lowest rate in the league. When facing four pass-rushers or fewer this season, Kizer’s 52.7 passer rating is the league’s worst by 23.8 points. Joe Flacco, owner of the second-worst passer rating when not facing a blitz (76.5), is actually closer to Josh McCown in ninth place (100.2) than he is to Kizer. G Clint Boling vs. DI Larry Ogunjobi – Boling is the Bengals’ highest-graded offensive lineman this season, and he’s one of only two Cincinnati offensive linemen to play every snap this season. He’s allowed one sack, zero hits and 11 hurries on 333 pass-blocking snaps, but his 43.4 run-blocking grade is the weaker half of his game, ranking 49th out of 76 guards. Ogunjobi made his return from injury last week and earned an 82.5 overall grade, which was the fifth-highest graded performance by a Browns defensive lineman this year. He’s generated seven run stops on 70 run-defense snaps, giving him the 10th-highest run-stop percentage among defensive tackles. WR A.J. Green vs. CB Jason McCourty – Green was shadowed by McCourty in their first matchup in Week 4. They lined up across from each other in that game for 97.1 percent of the routes run by Green, who was targeted seven times and caught five of them for 63 yards and a touchdown. Two of those catches and 31 of those yards came against McCourty, who is the third-highest graded cornerback in the NFL this season at 93.2 overall. He is one of only three cornerbacks this season to play more than 500 snaps without missing a tackle, and he’s allowing a career-low 51.1 passer rating when targeted. TE Tyler Kroft vs. LB Joe Schobert – Kroft’s highest-graded game of the season came in Week 4 against the Browns, in which he earned an 85.5 overall grade for catching all six of his targets for 68 yards and two touchdowns. Three of his targets and catches in that game came against Schobert in coverage, good for 38 yards and a touchdown. Quarterbacks targeting Schobert this year have a 133.4 passer rating, the fifth-highest among all linebackers. He’s also missed 12 tackles this season, tied for the fourth-most at his position. Schobert has 37 total stops this year, though, which is the seventh-most of any linebacker.